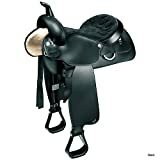 The western saddle was developed in the United States, using the basic design of the Mexican vaquero saddle. Western saddles are functional, working saddles designed to be used by cowboys on horse ranches, though they're now more commonly used for pleasure and trail riding. The traditional western trail saddle has a wide seat, horn, high cantle and heavy stirrups. The wide seat of the western saddle is designed to be comfortable for the rider who is spending hours in the saddle. Western saddles are also designed to be comfortable for the horse - the large surface area more evenly distributes the rider's weight. A serious drawback of western saddles however, is that they are heavy - weighing 30 - 60 lbs. (14 - 27 kg). Western Saddle is great for Western horses!